Things change, clearly. Including stuff that's already happened. If that sounds silly then I assure you history is a living thing; never is it settled. That's because it is dependent on interpretation, and the perspective of that interpretation, what it's compared with, can change as time passes. And so it is with the Hockenheimring, scene of this weekend's German Grand Prix. We're very much in the era of Hockenheim mark two, and while it would have been an absurd thing to say for a long time the previously-used Hockenheim mark one layout is these days viewed with something resembling widespread affection. As an example, in 2012 I recall stumbling across one circuit guide describe the current version as 'scarcely a shadow of its former great self'. 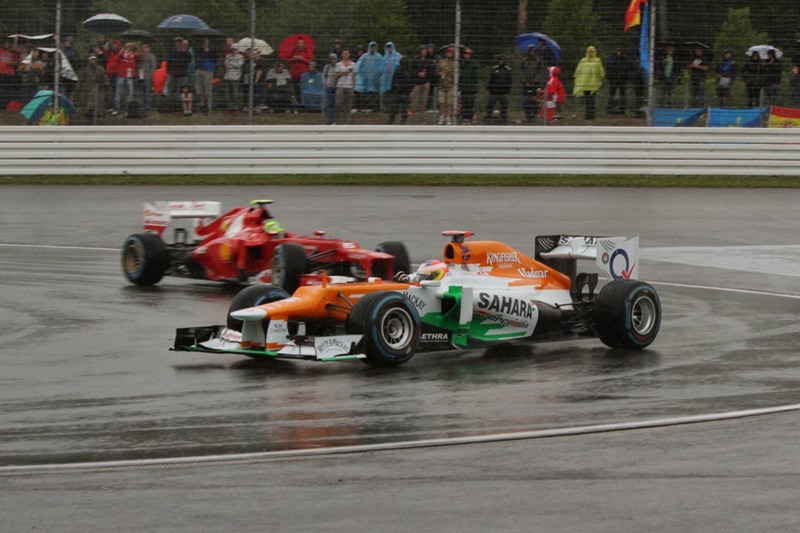 Modern day Hockenheim is quintessential Tilke, with short medium-to-low speed turns predominant, as well as a lengthy straight book-ended by slow turns, designed to promote overtaking (which it is often successful at, to be fair). Yet the cuddly tenderness common now wasn't at all the prevailing view of Hockenheim mark one in its own time either. For much of then it was considered a circuit without a soul. Little on or off the track quickened the pulse. Nothing much seemed to happen there, least of all in the races. Its prized image is one that has grown almost entirely in hindsight. Of course, that it had the near-impossible-act-to-follow status of replacing the old Nurburgring on the calendar was part of the problem. But it wasn't all of it. The layout then amounted essentially to lengthy straights interrupted by chicanes through thick pine forest, and ended with a serpentine 'stadium section' which wound within grey imposing concrete grandstands capable of housing 100,000 people. It was viewed as not being a challenge for drivers as well as simultaneously tough on engines due to them being on full noise for several seconds down the straights, thus ensuring races were battles for survival rather than necessarily those for the racers. Most probably the subsequent shift in views reflects the age of the sanitised Tilke-drome; that perspectives, and standards, have changed with the zeitgeist. And in fairness to the old place it did develop a couple of attractions towards the end. Most notably it was fast. And via that incrementally rare fact that it was distinct to the prevailing and increasingly bland orthodoxy that it developed some popularity, as a sort of circuit equivalent of Kimi Raikkonen. Further, the rise of Michael Schumacher did finally lend Hockenheim races an intense atmosphere via the hordes of his acolytes and their standard issue (it seemed) air horns who packed the grandstands and made much din. 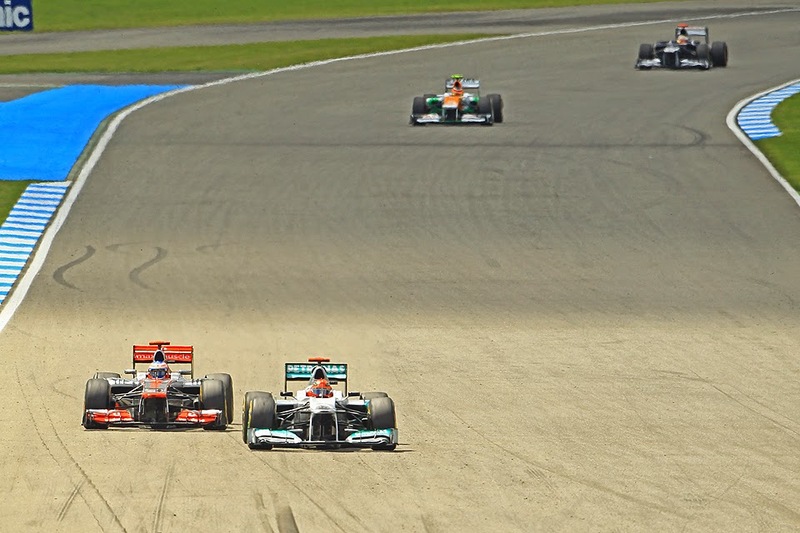 Still, we are where we are, and we approach the 2014 German Grand Prix at the modern Hockenheim, which debuted almost without skipping a beat in 2002, the venue taking its turn this year in its alternation with the also revised and largely unrecognisable from what was there before Nurburgring. As if to further demonstrate that nothing in F1 stays still for long, going back the two years to the fraternity's previous visit we find a sport barely congruent with now, in terms of the competitive situation at least. Then we had three drivers in three different cars locked in a close battle for the race win that lasted until the late laps. And the pole (helped by the adverse weather) and win was taken by Fernando Alonso in the Ferrari (which also resulted in him moving some 32 points clear at the drivers' table top). Without any disrespect intended to Nando no one is expecting a repeat of any of that this time. Yes, once again we face a Grand Prix weekend secure in the knowledge that only the very strange will result in the battle for first not being a private Lewis Hamilton vs. Nico Rosberg affair in the two Mercedes. Whatever sliver of light offered by the relative closeness of Austria and by Niki Lauda's resultant talk of 'alarm bells' down Brackley way was firmly snuffed out in Silverstone, when the Mercs were once again on another level. Perhaps even more so than they'd been anywhere else in 2014. And this is even with the much-discussed FRIC ban. That is, 'Front and Rear inter-connected' suspension, which is a system that has spread lately and that aids the suspension keep the car's ride height stable through corners, which in turn has an aerodynamic benefit. To some surprise Charlie Whiting expressed the view post Silverstone that the systems have gone too far and are against the rules - ostensibly on the grounds of being a moveable aerodynamic device but perhaps cost control is a factor too. Some are murmuring that matters are darker still. Whatever is the case it all means anyone who does run it in Hockenheim risks being thrown out - unless unanimous agreement is achieved among the teams is achieved to delay the ban until the season's end. On that last point, a dodo flying over the track probably is more likely. A few have assumed that the Mercedes system must be one of the better ones (though no one can really know for certain), with rumour having that team running both from back to front and also side to side FRIC, but still it would be a shock that may measure on the Richter scale if its passing is enough in itself for anyone to leap the chasm up to the silver cars' pace in one go (that the likes of Williams, Ferrari and Red Bull reportedly didn't push for an immediate ban suggests they don't expect this either). It won't happen in other words. But still it'll be interesting to see if there are shuffles in the pack behind. For example, paddock gossip has Force India not running FRIC (though the team's chief operating officer Otmar Szafnauer said on TV that the team has tested it) meaning it may help that team while Marussia's system apparently is a good one, so it might fall. A more familiar potential variable for Hockenheim is the weather, with rain there a fairly frequent feature, it indeed disrupting both Friday practice and qualifying the last time we were all here. In the last couple of visits tyre wear has been marginal also, and this time Pirelli's gone aggressive with soft and supersoft compounds. Which will no doubt create some giggles. Depending on the ambient temperature too tyre warm up can be hard to achieve in the first part of the lap. As outlined at Hockenheim there are no long corners, and most of the turns aren't especially quick either. There also is a lengthy straight. All of which should play into the hands of the Mercedes-powered runners. Williams has performed well on just about all types of track of late and seems well-placed to be best of the rest again. Valtteri Bottas has especially good momentum right now. As for the Mercs themselves, once again which driver will emerge on top is a tough call, though Lewis last time in Silverstone did manage to halt and reverse the creeping sense that everything was falling Nico's way. 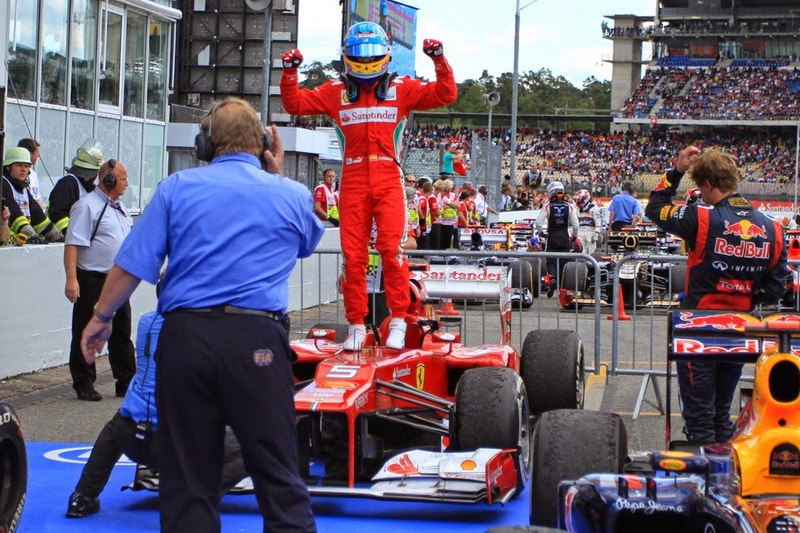 Fernando Alonso and Ferrari won on the last two Hockenheim visits. But the form unlikely counts for a great deal - even this combined with the Spaniard's personal other-worldly form of late is unlikely to ensure a hat-trick. We can expect him to be biting at the ankles of the Merc-powered cars as usual though. As will the Red Bulls. Not everything changes, clearly. And neither will be the team on top this weekend. I miss the old layout. Whilst I can understand some of the criticism about the racing there, I can tell you one thing: in the nineties motogp and superbikes raced on the old circuit. That was insane to see bikes around there!